Need a family-friendly recipe? 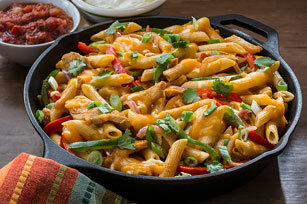 Go ahead and check out our Chicken Fajita Pasta recipe. This one is sure to disappear quickly - and that's a promise! Meanwhile, heat oil in large nonstick skillet on medium-high heat. Add chicken and garlic; cook 3 to 5 min. or until chicken is lightly browned, stirring occasionally. Add seasoning mix, water, red onions and peppers; cook and stir 3 to 4 min. or until vegetables are crisp-tender. Drain pasta. Add to chicken mixture in skillet; stir. Remove from heat. Add cheese; stir until melted. Sprinkle with green onions and cilantro. Serve topped with chopped fresh tomatoes, sour cream and/or salsa. Prepare using sliced grilling steak or flank steak.